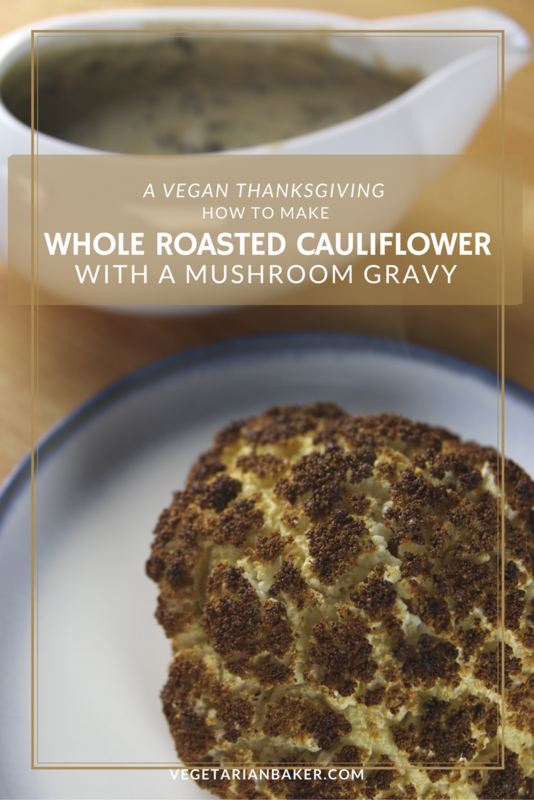 Thanksgiving is almost here and I’m ready to show you some of my favorite recipes to Celebrate a Vegan Thanksgiving. 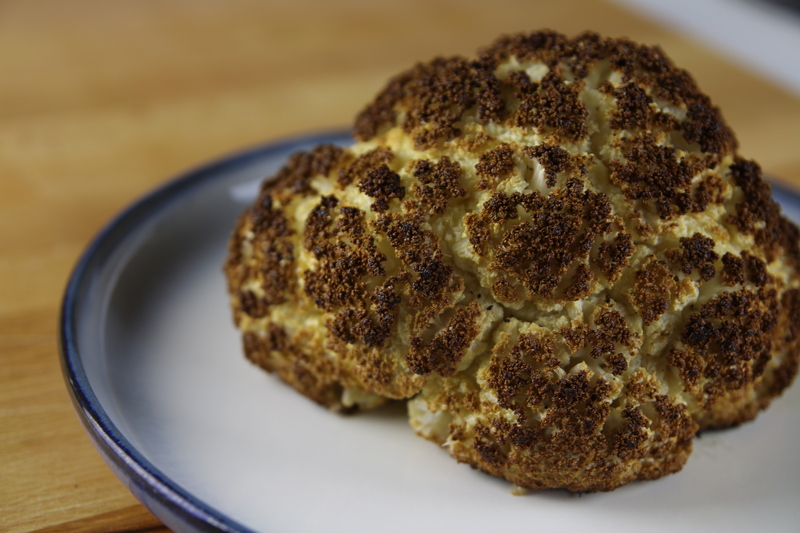 This recipe is for a simple but delicious Whole Roasted Cauliflower with a Mushroom Gravy. You don’t have to be vegan or vegetarian to enjoy this dish and it is also delicious year around. If you have recipe you would like to see me make, let me know in the comments below. Let me know of what you think of this recipe on via twitter or instagram (@vegetarianbaker & #thevegetarianbaker). Remove all of the green leaves from the cauliflower and cut down the stem. Leave the core intact. Wash the cauliflower, but don't dry off. Place on a parchment or silicone lined sheet tray. Coat the entire cauliflower in olive oil and season with sea salt and pepper. Place in oven a bake for 2 hours or until fork tender. Place a bowl of water underneath the sheet tray to help promote faster and even cooking. Every 30 minutes, add a little bit more olive oil to the cauliflower. Once fork tender, remove from oven and allow to cool some before serving. In a large sauce pan, heat olive oil on medium high heat. Add onions and mushrooms. Cook for 8 minutes. Whisk occasionally to prevent burning. After 8 minutes, add the rosemary and thyme. Cook for a remaining 2 minutes. Once your onions and mushroom have cooked for about 10 minutes and are brown, slowly add the flour a few tablespoons add a time. You should noticed that your mixture will thicken up. After all of your flour is added, slowly add the vegetable stock. Whisk together. Bring your gravy to a simmer and simmer for 2 minutes. Taste and season with salt & pepper accordingly. 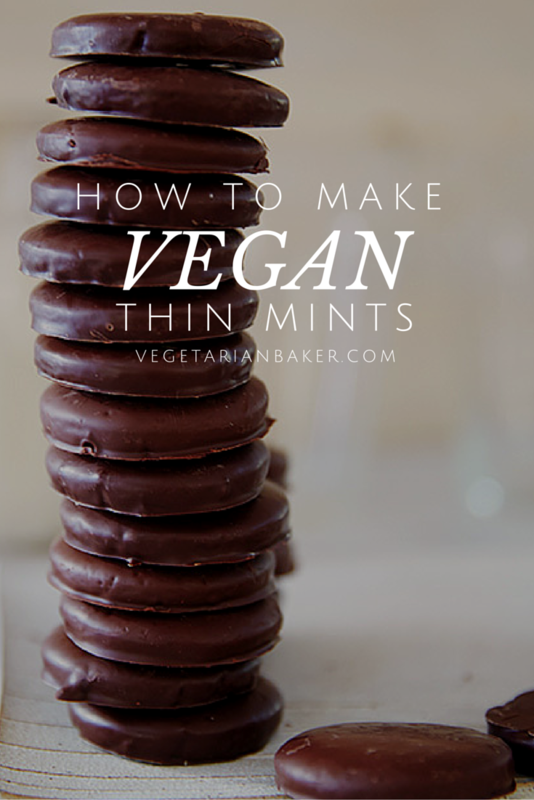 This looks like a great recipe. Anyone serious about their health should eliminate the olive oil because it contains about 180 grams of fat. You can spray the pan with olive oil spray, and just spray the head of the cauliflower lightly with olive oil spray also before seasoning. Doing this, you can reduce your fat intake drastically. The whole recipe fat from olive oil will be about 2-3 grams. When sautéing the onions and mushrooms, just put a couple of tablespoons of veg broth if they start to stick. ANYONE on a vegan or veggie diet because of a heart condition, should avoid ALL fat. That’s a great suggestion, David. Thanks for giving the alternative.